Establishment of Nurseries, Hi-tech horticulture etc. 1. Production and supply of Quality Planting Material among growers: During the period (2015-16) a total of 6679 saplings of hybrids / varieties of mango, guava, lemon, Kinnow, papaya, grapes and peaches were sold. Out of which, 2712 grafted saplings of mango (Amrapali, Mallika, Pusa Arunima, Pusa Surya, Pusa Pratibha, Pusa Shreshth, Pusa Peetamber and Pusa Lalima), 1927 Kagzi Kalan lemon, 207 Kinnow, 453 guava (Allahabad Safeda), 937 grapes (Pusa Urvashi, Pusa Navrang and Perlette) and 62 Florida Sun peach. In addition, 895 scion sticks of new mango hybrids were supplied to research institutes, state agricultural universities and growers. 2.Papaya Seed: During the period 1.150 kg papaya seeds of cv. Pusa Nanha were produced and sold. 3.Revenue Generated: The revenue generated from above was Rs. 5,86,280.00 (Rupees five lakh eighty six thousands two hundred eighty only). 4. National Extension Programme (NEP): Demonstration and monitoring NEP program undergoing at Varanasi centre for on-farm demonstration of varieties/ hybrids (Rice, wheat, mung bean, bottle gourd and pea) & technologies developed by IARI at various locations,viz., Varanasi, Bhadoi & Mirzapur districts of UP. 5. IARI-Model village programme: Visits have been conducted in model villages (Binjpur, Kutabi, Rajpur) for planting of IARI fruit varieties in coming season. Established orchards in IARI Model Village “Binjpur-Alwar, Rajasthan” and planted saplings of Kinnow mandarin (250 Nos), Malta (100 Nos), Mosambi (30 Nos), Acid lime (100 Nos), Karonda (400 Nos), ber (100 Nos), Lasoda (100 Nos), Khejari (50 Nos) and Falsa (100 Nos) along with Dr Mahendra Singh (Model Village Nodal Officer). Fruit plants were also planted in Kutabi of mango hybrids and lemon. Dr Awatar Singh visited Pataudi (Nurgarh and Ramnagar) in the Gurgaon district of Haryana under the Mera Gaon Mera Gaurav programme of IARI and Held a Kisan Goshti. Our team also visited the fields of different farmers and suggested the on spot measures for the problems raised by them. Dr M.K. Verma visited along with 3- other team members (Mr. Anirban Dutta, Agri. Chemicals, Dr Shankar Ganesh, Entomology, Dr Mir Asif Iqbal, IASRI) the five villages, viz., Khatsara, Jundpur, Janti Kala, Jakhauli and Aterana of Sonipat District of Harayana and collected baseline information under MGMG. Visited the allotted villages under MGMG and demonstrated various technologies developed by the Division. Dr Manish Srivastav, visited cluster of villages (District Panipat) and interacted with the Sarpanch and other villagers. Baseline information about villages has been obtained. Distributed literature on mango, guava, papaya and citrus among the villagers. Dr R.M. Sharma visited his cluster in Ghaziabad district on 4.1.16 under MGMG programme under MGMG programme. Participation in Extension activities/ Kisan Mela/ Seminar/ Brainstorming etc. Displayed and disseminated technologies developed by Division through participation inKrishi Unnati Mela held during 19.03.16 to 21.03.16 at IARI, New Delhi. Mango Day organized by the Division of Fruits and Horticultural Technology, IARI, New Delhi on July, 15, 2015. Displayed varieties and technologies in Agri-Exhibition and Kisan Gosthi at Jaspur, Udham Singh Nagar, Uttarakhand vide letter No. PA/CATAT dated 10.06.2015. Displayed the technologies in Exhibition organized by National Horticulture Board on occasion of Laying Foundation Stone of IARI Jharkhand at Barhi, Hazaribagh, Jharkhand from 28-29th June, 2015. 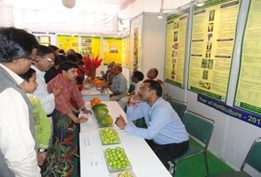 Exhibited fruit crop related technologies in a Kisan Mela organized by YFA, Rakhara, Patiala, Punjab on 16.9.15. vide letter No. PA/CATAT/2015/1096 dated 01.09.2015. Organized a brainstorming session on “Digitally Linked Smart Fruit Farms for High Productivity and Profits” organized by the Division of Fruits and Horticultural Technology, IARI, New Delhi on March, 7, 2016. Participated in Pusa Horticultural Show 2016. Displayed the technologies in Exhibition organized by Smart Agri Post at Bhubaneswar from 12-13th Feb., 2016. Demonstrated improved production technologies of fruit crops to the farmers visiting from various states at the Divisional orchards (Main Garden). Technical support were provided by scientist for planting and aftercare of Amrapali mango to institute adopted villages at farmer’s field in four-locations of Haridwar district of Uttarakhand under Agri-Horticulture Development Project under the leadership of Head, Agricultural Extension/ CATAT. Demonstrated Improved production technologies of fruit crops to the farmers at the Main Orchard of the Division. Dr M.K. Verma Delivered a lecture on “Fruit varieties” in an Agri-Exhibition and Kisan Gosthi at Jaspur, Udham Singh Nagar, Uttarakhand vide letter No. PA/CATAT dated 10.6.15. Dr M.K. Verma Delivered a lecture on “Bagwani udyog ki vartman sthiti: chunotiya aur samadhan” in a training program for farm women of Bihar State at CATAT on 23.11.15. Dr M K Verma delivered Delivered a lecture on “Jalvayu parivartan ke karan bagwani mein vividhikaran” in a training program for Extension Officers of NCR at CATAT on 21.10.15. Dr M.K. Verma Delivered a lecture in a awareness camp organized by IARI and UP Seed Grower Association at Bhurekha, Mathura, UP organized on 15.6.15. Dr M.K. Verma Delivered a talk on DD Kisan on “Angoor ke utpadan ke liye avasyak kriyae” on 18.5.15. Dr M.K. Verma Delivered a lecture on “Bagwani ki unnat takniki” in a training programme organized by CATAT for the farmers of Purnia district of Bihar on 30.4.2015 vide letter No. PA/CATAT/2015/838 dated 9.4.15. Dr Kanhaiya Singh delivered lecture on “Technologies for mango, litchi and guava production” in Training “Improved Agricultural Technologies for Higher Income” organised by CATAT Indian Agricultural Research Institute New Delhi. 8 July, 2015. Dr Kanhaiya Singh delivered lecture on “High –Tech nursery of fruit crops” in Training “Inclusive Horticultural Development, Improved Soil and Water Conservation Methods” organised by CATAT Indian Agricultural Research Institute New Delhi. 24 November, 2015. Delivered a lecture on “Improved horticultural Technologies” in Training “Organic Farming & Improved Agricultural Practices” organized by ATIC, Indian Agricultural Research Institute New Delhi. 8 March, 2016. Dr M.K. Verma, Principal Scientist (Hort. ), delivered a lecture on “Baagwani Udhyog ki vartmaan sthiti: Chunotia aeom samadhan” (in Hindi) in a technical training program on Horticulture Development and improved soil and water conservation practices for farm women of Bihar state at CATAT, IARI, New Delhi on 27th November, 2015. Dr Madhubala Thakre, Scientist (Hort. ), delivered a lecture on “Phal ke podho ka ucch ghanatava ropan” (in Hindi) in a technical training program on Horticulture Development and improved soil and water conservation practices for farm women of Bihar state at CATAT, IARI, New Delhi on 24th November, 2015. Dr Manish Srivastav, Senior Scientist (Hort. ), delivered a lecture on “Phal phaslo ka kayakalp aour canopy prabandhan” (in Hindi) in a technical training program on Horticulture Development and improved soil and water conservation practices for farm women of Bihar state at CATAT, IARI, New Delhi on 24th November, 2015. Dr Kanhaiya Singh, Principal Scientist (Hort. ), delivered a lecture on “Ucchh-takaniki ka vyavharik Prashikshan” (in Hindi) in a technical training program on Horticulture Development and improved soil and water conservation practices for farm women of Bihar state at CATAT, IARI, New Delhi on 27th November, 2015. Division actively participated in Pusa Krishi Vigyan Mela-2014, Krishi Unnati 2016 and Pusa Horticulture Show 2015at IARI, New Delhi. 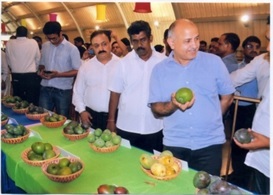 Participated and displayed different technologies and improved varieties of fruit crops in Mango Show (2014) organized by Delhi Tourism Department at Delhi Haat, New Delhi. 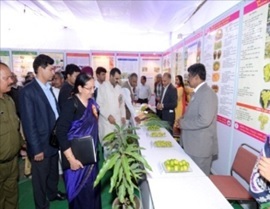 Participated and displayed Divisional varieties developed at Mango Exhibition (2014) organized by ICAR, NASC, Pusa Campus, New Delhi. A.K. Singh, S.K.Singh, Manish Srivastav, Jai Prakash and M.K.Verma organized eight days MTC on GAP in Production of Horticultural Crops during March 11-18, 2013. Singh, S. K., Munshi, A.D., Prasad, K.V. and A.K.Sureja, organized six month International Training on Teaching of post-graduate courses in horticulture (Fruit science) for Afghanistan scientists during September 2013 to January 2014 In collaboration with Post Graduate school, IARI, New Delhi-110012. Dr Jai Prakash was associated with different extension activities through farmer’s day celebration, Kisan mela, lectures for various trainings for farmers (as technical nodal officer and as resource person) and providing advises to farmers etc. Dr (Mrs.) Madhubala Thakre attended five days training on “Science and technology for rural societies” from September 2-6, 2013 at IIPA, New Delhi. Dr (Mrs.) Madhubala Thakre attended ten days training entitled “Enhancing input application efficiency through precision farm machines, remote and ground sensors” from 14-23 November, 2011 at PAU, Ludhiana. Dr (Mrs.) Madhubala Thakre attended winter school on “Advances in micro irrigation and fertigation”from 05th to 25th November 2012 at IARI, New Delhi.